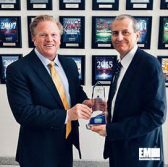 TYSONS CORNER, Va., May 2, 2018 — Craig Abod, president of Carahsoft, has received the 2018 GCW Readers’ Choice Award for GovCon Executives after garnering the highest number of votes among his category in Executive Mosaic‘s 2018 Wash100 list, GovConWire reported Wednesday. Abod, who is a four-time Wash100 inductee, earned 832 out of the 24,131 total votes tallied by end of day Monday, April 30th. The Wash100, now in its fifth year, recognizes the premier private and public sector GovCon leaders as hand-picked by Executive Mosaic’s election committee. Individuals selected must have demonstrated superior leadership, innovation, reliability, achievement and vision. “As GovConWire has the largest circulation among GovCon executives, it is an honor to be selected by the publication. However, it is even more impressive to be recognized by your peers as among the top echelon of GovCon leaders. We couldn’t be more thrilled to present Craig with this prestigious award,” said Jim Garrettson, Executive Mosaic’s CEO and founder.